The Patuxent Wildlife Research Center (PWRC) and American Bird Conservancy (ABC) have been working together to build a repository for storing Partners in Flight point count data as well as other point count datasets. The web-based Bird Point Count Database is now ready for use by anyone conducting monitoring programs using point counts. This includes bird point count data collected using standard protocols anywhere in North America (U.S., Canada, and U.S. Territories). This database will expand the available scales for point count data analyses well beyond what is feasible with locally managed survey data. The BBS is a long-term, large-scale, international avian monitoring program initiated in 1966 to track the status and trends of North American bird populations. The USGS Patuxent Wildlife Research Center and the Canadian Wildlife Service, National Wildlife Research Center jointly coordinate the BBS program. Each year during the height of the avian breeding season, June for most of the U.S. and Canada, participants skilled in avian identification collect bird population data along roadside survey routes. Over 4100 survey routes are located across the continental U.S. and Canada. Once analyzed, BBS data provide an index of population abundance that can be used to estimate population trends and relative abundances at various geographic scales. Trend estimates for more than 420 bird species and all raw data are currently available via the BBS web site. Prior to 1989 no regional survey existed of waterfowl breeding populations in the northeast United States. In 1989, the Atlantic Flyway Technical Section initiated this breeding waterfowl survey in 11 northeast states ranging from New Hampshire to Virginia. The purpose of this survey was to collect breeding population abundance data that would support effective management of eastern waterfowl breeding populations. Prior to this survey (and Federal breeding waterfowl surveys initiated in 1990 in eastern Canada and Maine) eastern waterfowl populations were managed based on data collected for mid-continent populations. This survey was designed primarily to estimate population sizes of mallards (Anas platyrhynchos platyrhynchos), black ducks (Anas rubripes), wood ducks (Aix sponsa), and Canada geese (Branta canadensis), however all observed waterfowl are recorded. Existing breeding population surveys for North American waterfowl do not cover the core ranges of about half of North American sea duck species. Many species of North American sea ducks breed across vast Arctic regions that are difficult and costly to survey. Winter waterfowl surveys such as the Mid-winter Waterfowl Survey typically do not cover near shore or offshore coastal habitats used by sea ducks. The Atlantic Flyway Sea Duck Survey, conducted by the U.S. Fish and Wildlife Service, was established in 1991 to record sea duck numbers using near shore (within 700 m of shore) habitats from Cape Breton, Nova Scotia to Jacksonville, Florida. The Mexican Mid-winter Waterfowl Survey is a continuation of the annual winter waterfowl survey which is conducted in the United States and Canada. Since the survey's inception in 1947, it has been divided into 3 main surveys: the Gulf Coast, the Interior Highlands, and the Pacific Coast. Since 1985, the surveys have been run every three years, 2006 being the last. In the off years, a redhead survey is flown in Laguna Madre on the Gulf Coast and a Brant goose survey on the upper (from Mexicali to Cuyutlan on the West Coast and from Bahia de Magdalena to San Quintin in the Gulfo de California) part of the Pacific Coast. The Mexican Mid-winter Waterfowl Survey provides wintering habitat conditions, waterfowl habitat utilization, waterfowl distribution patterns, and general population trends. The data obtained from this survey is used to manage Mexican duck populations and to study the effects of wetland drainage and development. It is conducted cooperatively by the U.S. Fish and Wildlife Service and Mexican officials. Some geese and ducks are not adequately monitored during the spring and summer because they nest in areas not well covered by breeding population surveys. Abundance indices for these species are obtained from surveys on wintering areas. Most of these surveys are targeted at specific species or populations. A nationwide effort to survey all waterfowl is conducted annually in January. This, the Mid-winter Waterfowl Survey, provides information on population trends for some species, distribution on the wintering grounds, and habitat use. The Mid-Winter Waterfowl Survey is conducted cooperatively by the states and the U.S. Fish and Wildlife Service. The Waterfowl Breeding Population and Habitat Survey was initiated experimentally in 1947 and became operational in 1955.It is conducted cooperatively by the U.S. Fish and Wildlife Service and Canadian Wildlife Service. It has been conducted every year since. The primary purpose of the survey is to provide information on spring population size and trajectory for certain North American duck species. These data are used extensively in the annual establishment of hunting regulations in the United States and Canada and provide long-term time series important in researching bird-environment relationships critical to effective conservation planning for waterfowl. The Waterfowl Production and Habitat Survey, conducted by the U.S. Fish and Wildlife Service, became operational in 1955 in the Canadian prairies (strata 26-40). In the north-central United States strata were phased in during 1958 (strata 43, 45-47), 1959 (strata 44, 48-49), and 1966 (strata 41-42). In Canada’s Northwest Territories and northern Alberta, strata (13-18,75-77) have been surveyed since 1966. 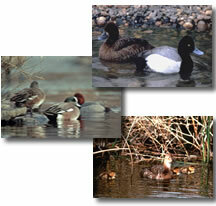 The primary purpose of the survey was to provide information on duck production from the mid-continent breeding areas. These data were used in the past to forecast the annual fall flight of ducks. Present applications include research on habitat, climate, and waterfowl production relationships important in harvest regulation and habitat conservation. The American Woodcock (Scolopax minor) Singing-Ground Survey, conducted by the U.S. Fish and Wildlife Service, exploits the conspicuous courtship display of the male woodcock. The survey consists of numerous routes in the eastern half of the U.S. and Canada, which are surveyed in the spring. Counts of singing male woodcock along the routes provide an index to woodcock abundance, and are used to estimate woodcock population trends for states, provinces, management regions, and the continent. The survey is the major source of information considered in the annual setting of woodcock hunting seasons. These data can also be used to examine the effects of weather, landscape change, and other factors on woodcock population abundance. The Mourning Dove (Zenaida macroura) Call-Count Survey was developed to provide an index to population size and to detect annual changes in mourning dove breeding populations in the U.S. The survey consists of numerous routes throughout the U.S., which are surveyed in late May and early June. The resulting estimates of relative abundance and population trends comprise the principal information used in the annual setting of mourning dove hunting seasons. These data can also be used to examine the effects of weather, landscape change, and other factors on mourning dove population abundance.